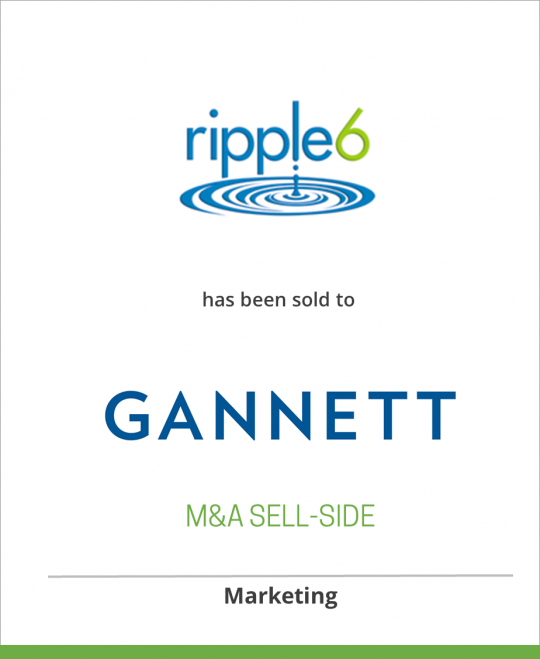 Ripple6 Inc. has been sold to Gannett Co.
Ripple6™ helps marketers and publishers implement their business strategy through social media. The company provides an enterprise white label social media platform to create consumer engagements and relationships, enable social marketing, generate consumer insights, and facilitate commerce and collaboration. It is easily customized to incorporate a brand’s look and feel for integration into an existing web site or to create an entirely new site. Ripple6 is based in New York and its list of clients and partners includes Procter & Gamble, Gannett Co., Meredith Corporation, and General Mills. For more information, visit www.ripple6.com. Gannett Co., Inc. (NYSE: GCI) is a leading international news and information company which publishes 85 daily newspapers in the USA, including USA TODAY, the nation’s largest-selling daily newspaper. The company also owns nearly 900 non-daily publications in the USA and USA WEEKEND, a weekly newspaper magazine. Gannett subsidiary Newsquest is the United Kingdom’s second largest regional newspaper company. Newsquest publishes 17 daily paid-for titles, approximately 300 weekly newspapers, magazines and trade publications, and a network of award-winning Web sites. Gannett also operates 23 television stations in the United States and is an Internet leader with sites sponsored by its TV stations and newspapers including USATODAY.com, one of the most popular news sites on the Web.